Every so often, a chance piece of minor information comes to light which allows a brief glimpse into a life that would normally be forgotten. In this case, the the discovery of a letter written home by one soldier who volunteered to fight for King and Country in the Great War of 1914-1918 about another soldier whose life was accidentally cut short because, as a witness stated, the victim was possibly deep in thought. When Britain declared war on Germany on the 4th August 1914, there was certainly a lot of enthusiasm among some groups of Australians but the news was by no means universally acclaimed or accepted. Most Australians were lukewarm about it at best. The early volunteers enlisted to fight with mother England in a war which was expected to be over by Christmas. Henry Wright was the eldest and the first of four sons to answer the country's call to war. Private Wright, A Company 14th Battalion, Australian Imperial Forces arrived on Gallipoli 26th April and took part in early battles. He was wounded by shrapnel in an attack on Hill 60 on 21st August. Hill 60 was renamed "Bombe Tepe" [Grenade Hill] by the Turks because of the nature and ferocity of the fighting. It was a brutal affair, mostly fought in trenches with bayonet and grenade. Private Wright was evacuated to the Military hospital [New End] at Hampstead, North London. Once he had recovered sufficiently Private Wright was transferred to No 5 Australian Intermediate [Convalescent] Depot at Bostal Heath arriving 27 November. Bostal Heath and Abbey Wood is an area on the eastern edge of the London Borough of Greenwich between Plumstead to the west and Erith to the east. Abbey Wood takes its name from the nearby Lesnes Abbey. Australian soldiers deemed fit enough, spent time here before returning to active service. Letters home have either Abbey Wood or Bostal Heath as the address where the soldiers were stationed. The same day Private Wright arrived, Trooper William Keelan was accidently killed. 8 December 1915. Australian Base Camp, Abbey Wood, Kent, England. ‘We had a military funeral here last Tuesday. 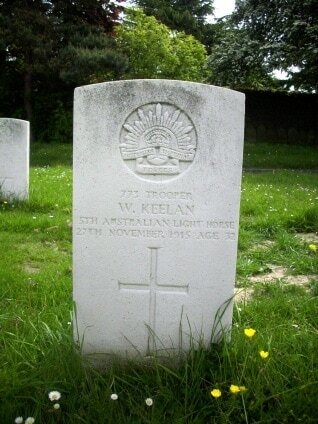 One of the Australian Light Horsemen was run over by a motor car and killed and was buried in the Plumstead Cemetery. We were told by our officers that the funeral was voluntary but 1,500 of us followed his remains to the graveside. 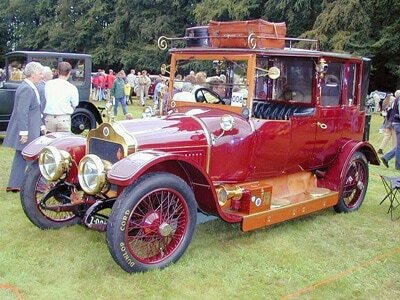 The coffin was mounted on a gun carriage and drawn by four horses. A band playing the ‘Dead March’ headed the fellows. 2 At the graveside, a party fired a volley over the remains, and the Last Post was played by the buglers. It was a most impressive sight and one I am not likely to forget. This poor chap was married to an English girl only two weeks. [It was almost 7 weeks] The poor thing was very much cut up and had our sympathy. Well dear mother and father, I will close my letter. I remain your loving son, Henry.’ Sadly, Private Henry Wright did not survive the war nor did anyone attend his funeral. He was killed on the Western Front in the vicinity of Ascension Wood south-west of Bellicourt on 19 September 1918 and has no known grave. William Keelan was originally a resident of Gatehouse of Fleet, Kirkendbrightshire, Scotland and after a brief service in the British Navy and the Kings Own Scottish Borderers he immigrated to Australia and was working on a farm in Queensland when war was declared. He Enlisted 30th December 1914 and became a trooper in the 5th Light Horse, 3rd Reinforcements and embarked aboard HMAT Itria bound for Gallipoli. The mounted troops of the Light Horse were considered unsuitable for operations on Gallipoli so the men volunteered to fight as infantry. Landing on the 20th May 1915, the Regiment was only deployed on defensive duties. Trooper Keelan was evacuated from Gallipoli suffering from dysentery and admitted on 17th September to Reading War hospital in West Reading in Berkshire to recover. Fourteen days later he was transferred to Bostal Heath Convalescent Depot. In his service records held in the National Archives in Canberra, there is no mention of his applying for permission to get married or take leave. However, only a few days after his arrival at Bostal Heath, he married Elizabeth McCloskry at Kirkcudbright in Scotland on 12 October. Keelan had been in touch with Elizabeth over a period of time. Perhaps Elizabeth was a love from his past as she had lived in William Street Dalbeattie which is not that far from his home town, Gatehouse of Fleet. As a consequence of the war, the correspondence got serious and the fighting on Gallipoli gave emphasis to the relationship. It was difficult at the time to get men resting at half way convalescent depots back to the fighting in Egypt and the Peninsula. This was a common complaint made by all field commanders at Gallipoli. Reams of correspondence filled with this very complaint came from disgruntled officers. Once the wounded men were gone, regardless of their status, they rarely returned until some great time later. It was not unusual for a person to recover from their wounds only to spend the next half year waiting in a convalescent depot. This would explain why Keelan was able take leave, possible a grant of a month, go to Scotland and get married. The happy couple returned to Abbey Wood by 4 November. The marriage ended tragically when on 27 November Trooper William Keelan was struck by a motor car and killed. 3 He was laid to rest in the Woolwich/Plumstead cemetery with full military honours while Reverend C.A.Peacock, the senior chaplain to the forces officiated at the funeral service. As Private Wright wrote in his letter of Elizabeth who attended the service; ‘The poor thing was very much cut up and had our sympathy.’ The large turnout at the funeral was not unusual at the time. There were many men at the depot who had nothing much else to do with their time. Also by attending, they not only paid their respects to a fellow soldier, they possibly hoped to be paid the same respect if it were them. ​At the coronial inquest four witnesses gave evidence about the accident. The following are extracts from their statements. The personal belongings of Trooper Keelan’s sent to his next of kin in package no 7563 consisted of; Testament [arcane reference to the Bible] hair brush, knife, Emu feathers [part of the Light Horse slouch hat decoration] shells [a collection of sea shells from Gallipoli], match box, cigarette holder and money clip.10 His kit belonged to the government and had to be returned but many times the unofficial practise was to auction off a soldiers kit with the proceeds going to the soldier’s widow. A person would buy a particular item and replace it with a similar worn item. At the end of it, a ragged kit was returned to ordnance which was generally destroyed. As Private Wilson had stated at the inquest, the deceased man was crossing the road as though deep in thought and with his head down. Was he returning to the depot after a visit to his new wife? Were his final thoughts possibly ‘Oh Elizabeth my sweet’ before he was struck by the motor car? We will never know. 2- ‘Dead March’ is played at military funerals and executions. 3-Approximately 8000 Australian soldiers met and married English [UK] women. Most returned to Australia with them. 4-10 Australian National Archives, Canberra. William Keelan service records. Series no B2455.